Fortress Of Freedom Board :: View topic - 4/20 Pot Protest In Toronto! 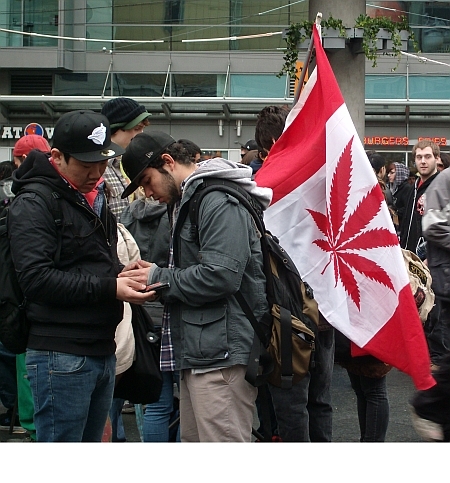 4/20 Pot Protest In Toronto! 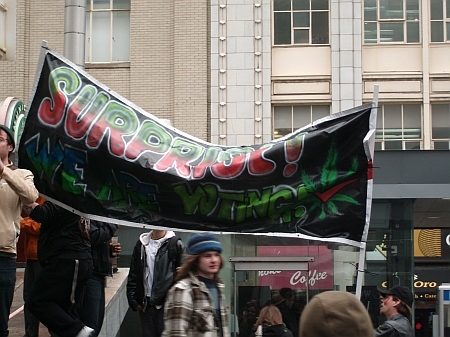 Posted: Thu Apr 21, 2011 4:45 pm Post subject: 4/20 Pot Protest In Toronto! 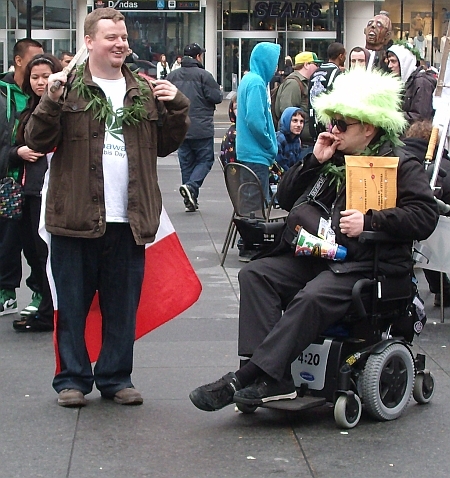 A pot dressed and pot flag carrying supporter! Toronto/April 20, 2011. 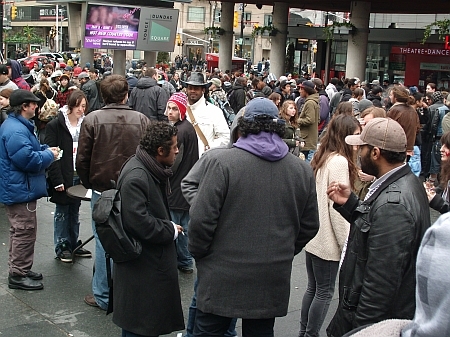 About 2,000 to 3,000 marijuana supporters gathered at Yonge-Dundas Square to celebrate marijuana use and protest marijuana laws on the all important day of 4/20 at the all important "420 Smoke Out". What does 4/20 mean? Nobody is quite sure from a possible time high school kids used to gather to smoke pot to an incorrect police designation for illegal pot use. It does not matter, the term 4/20 is what it is and that is big news for pot smokers world-wide. What follows are some photos of the event. The large crowd at Yonge-Dundas Square! A banner at the event. 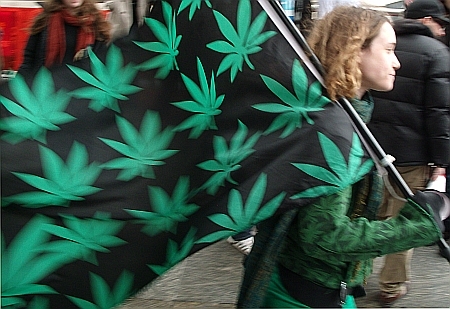 This year the group concentrated on pot use and the Federal Parliament election. 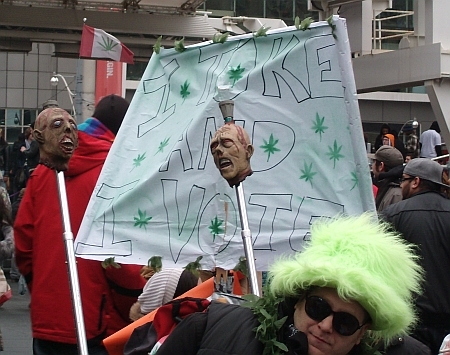 One of the placards stated "I toke and I vote" while another banner stated "Surprise! We are voting". 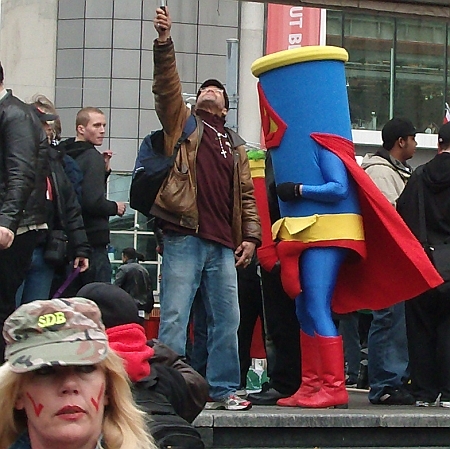 There was a person dressed up in a superman/bong outfit called "Bongman" and wandered around the stage and square delighting the crowd. Although very laid back there was some advocacy going on at the event which was mostly centered around the confusion with the medical marijuana. Also surprising were the police at the event (mostly bicycle cops) who just stood off to the corner of the square and talked with the camera crews of the news agencies there. They did not seem to have any intention of enforcing the drug laws when thousands of people were breaking them in plain sight. The "I toke and I vote" placard! As protests go this one was very disorganized and confused and a huge food vending bus was stopped at the front of the square on Yonge Street doing good business.